Taking up space within the skull, a brain tumor can interfere with normal brain activity, increasing pressure in the brain, shifting the brain or pushing it against the skull. It may also invade and damage nerves and healthy brain tissue. 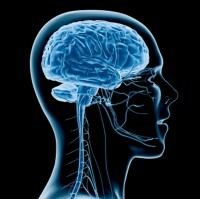 The consequence of abnormal growths of cells in the brain, brain cancers can arise from primary brain cells, the cells that form other brain components (for example, membranes, blood vessels), or from the growth of cancer cells that develop in other organs and that have spread to the brain by the bloodstream (metastatic brain cancer). Although many growths in the brain are popularly called brain tumors, not all brain tumors are cancerous; cancer is a term reserved for malignant tumors. Malignant tumors grow and spread aggressively, overpowering healthy cells by taking their space, blood, and nutrients, and like all cells of the body, tumor cells need blood and nutrients to survive. This is especially a problem in the brain, as the added growth within the closed confines of the skull can lead to an increase in intracranial pressure or the distortion of surrounding vital structures, causing their malfunction. Benign tumors are tumors that do not grow aggressively. Almost all tumors that begin in the brain do not spread to other parts of the body. The major difference between benign and malignant tumors is that malignant tumors can invade the brain tissues and grow rapidly; this rapid growth in the confines of the skull can quickly cause damage to nearby brain tissue. A benign tumor is generally less serious than a malignant tumor, but a benign tumor can still cause many problems in the brain. However, the problems usually progress at a slower rate than malignant tumors. Brain tumors may have a variety of symptoms, ranging from headache to stroke. Different parts of the brain control different functions, so symptoms will vary depending on the tumor’s location. Brain tumors are great mimics of other neurological disorders, and many of the common symptoms could indicate other medical conditions. In most cases, the cause of brain cancer is unknown. However, they are not infectious; you cannot catch a brain tumor. Brain tumors are relatively rare, and are slightly more common in males than in females. However, one type of brain tumor, meningioma, is slightly more common in women. People can get brain tumours at any age. Generally speaking, as we get older our risk of brain tumours increases, but there are many different types of brain tumors and some are more common in younger adults. Overall, more brain tumours are diagnosed than in the past. But this is mostly because we are living longer and brain tumours are more common in older people. Brain tumors can be genetic; if you have a parent, brother or sister diagnosed with a tumour of the nervous system, your risk is higher than other people in the general population. Jewish people have a higher risk of meningiomas than other groups, which may be due to genetic factors. In our environment, the only definite risk we know of is exposure to radioactivity (ionising radiation). Meningiomas and malignant glioma are more common in people who have had radiotherapy to the head in the past. Children who have had radiotherapy to the head as a treatment for acute lymphoblastic leukaemia ALL) are known to be at a slightly increased risk of brain tumours. Women who have had breast cancer have a slightly increased risk of having a glioma. One study has shown that people with a previous nasopharyngeal cancer have an increased risk of brain tumors, which may be due to unknown shared environmental causes between nasopharyngeal cancer and brain tumours. There is some evidence that people with food or respiratory allergies may have a slightly reduced risk of brain tumours, although it is not clearly understood why this should be. People with HIV or Aids have a slightly increased risk of brain cancer. A specific rare type of brain tumour called primary cerebral lymphoma is more likely to develop in people whose immune system is not functioning properly due to AIDS or medicines taken after an organ transplant. Folic acid – Folic acid can help prevent your cancer from spreading. Try 400g a day, or choose foods with folic acid, such as spinach, darker greens, leafy veggies, oranges, rice, and beans. Antioxidants – Foods with a high level of antioxidants are known to fight and prevent brain cancer. Choose blueberries, strawberries and grapes; the fresher the fruits and veg, the greater the benefit – eating them raw is generally the best option and don’t cut off the skins if possible. Omega-3s – Introduce plenty of fish to your diet, as it includes omega-3s, which can help locate and fight cancer cells. Tomatoes – Containing an ingredient called lycopene, tomatoes are believed to be beneficial in fighting cancer. Vitamin D – incorporate vitamin D into your diet, as it is believed to slow the growth of tumors. Try 800 to 1,000 units a day. A little sunlight also helps you to gain vitamin D, but do seek advice from a health practitioner first as it can interfere with other cancer treatments. Siberian ginseng, extracts of mushrooms like shiitake, cat’s claw, astragalus, St John’s Wort, niacin, whey protein, shark liver oil, melatonin, germanium, vitamins C and E are also beneficial in the treatment of brain tumors. Typical dosages of vitamin C are 250 to 1,000 mg a day, and usual dosages of vitamin E are 400 to 600 units a day – do discuss any new medications with your health practitioner.